There are many programs geared towards helping small businesses participate in the federal contracting industry. The 8(a) program is designed for socio-economically disadvantaged folks to get their foot in the door. There are rules that are well covered by the SBA, but a key component is the non-negotaitable 9-year clock on the certification, regardless of how well you’ve done. Many business owners in their 7th, 8th or even 9th year, don’t have a plan for getting beyond their 8(a) status. Even though it is easy to get busy and wrapped up in 8(a) benefits, there is an expiration date…it is given to the business when they are certified. Those who really understand its value can maximize their revenue stream and profit while utilizing it to compete in a full and open environment. There is an art and a science to this maximization. Here’s the trick – Don’t apply for 8(a) certification the minute you are eligible. This sounds counter-intuitive since the program is designed for helping those grow their companies. But slug it out a few years without the certification and get some great subcontracting performance under the belt before applying for the certification. Build relationships with great Primes and more importantly, the customers. Only then should one apply the “special sauce” that comes with dangling the idea of a sole source to their customer. Propose meeting subcontracting goals to a large prime with whom you’ve already worked. By this point, you are a known player and less of a risk, with a check in the box for their contracting goals. Stop hiring friends and family. Stop playing only the 8(a) card. Don’t be cheap on internal resources. Go after full and open opportunities as early as possible. Spend profits on hiring a strong BD and proposal shop. Invest in building beyond the status. Have a differentiator beyond a status. As time ticks down, with a strong Capture and BD team, a business can start maximizing their status to rack and stack revenue wins. This will help to carry them over the inevitable waterfall of dropping revenue when they lose their eligibility to bid. For Pete’s sake, get another 8(a) to set up contracts with reciprocal work share. Do not wait until the 8th year (or the eleventh hour) to come up with a successor. That relationship is vital to hanging on to billets in the out years. Leverage it to gain workshare on the non-8(a) work that a business can deliver on. While it does feel like every year in GovCon seems like seven years, the clock for 8(a)’s winds down FAST. Don’t waste the opportunity. Thank you for such an informative article. I intend to use this information to my benefit, considering we’ve be subcontractors on several contracts, some w/ longevity; some short term. I also recently submitted my 8(a) application, in hopes of being approved for the program. 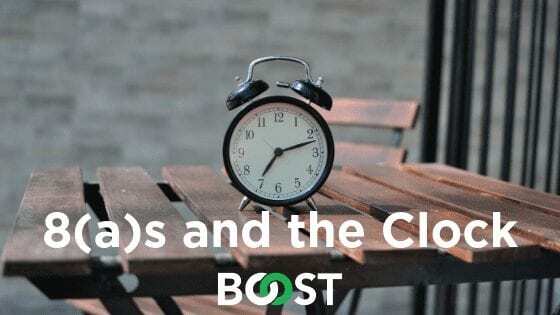 © Copyright 2019 by BOOST LLC.